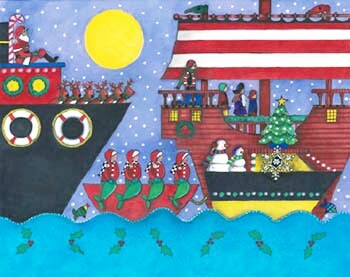 After shopping downtown, mosey on over to Newport’s Annual Holiday Harbor Lights Illuminated Boat Parade and Blessing of the Fleet (weather permitting), starting at 6:15 p.m. and visible from the harbor front. Boats gather at the Goat Island causeway and begin the parade at the Newport Yacht Club (which is open to the public tonight), then sail towards downtown continuing to King Park. Bowen’s and Bannister’s Wharf should be good viewing points, especially with warm hot cocoa from The Coffee Grinder or People’s Café in hand, or sip a fine wine surrounded by the warmth and elegance of 41 North where the Oval Bar and Pavilion Bar offer great views. SHOULD THE WEATHER BE QUESTIONABLE, CALL THE HARBORMASTER LINE AT 845-5815. Entry filed under: Uncategorized. Tags: 41 North Newport ri, Bannister's Wharf Newport Ri, Bowen's Wharf Newport, firepits newport ri, Newport Harbor Lights Illuminated Boat Parade, Newport Yacht Club. Black Friday Bargain Hunting By the Sea	Holiday Shopping’s Sweet Rewards!